At a splashy event in New York's Time Warner Center, Samsung dove headlong into the electronic book market with the Samsung eReader, a $299 device which allows you to take notes in the margins and share content with other Samsung eReaders. The slide-open unit features a six-inch, 600-by-800-pixel, 8-gray-scale electronic ink display and uses a magnetic resonance stylus instead of a touch screen. Samsung announced a relationship with Barnes and Noble which allows the eReader to access B&N's arsenal of more than a million e-books and e-magazines as well as access to Google Books. 2,400 memos, it offers a microSD slot for additional storage capacity. The eReader offers Bluetooth 2.0 connectivity for wireless headsets and other wireless audio devices and a Wi-Fi adapter for Internet access. One differentiator from the crowd of e-readers the Samsung model joins: With the eReader, you can write notes and annotations in the margins of an e-book just as you would in a physical book. 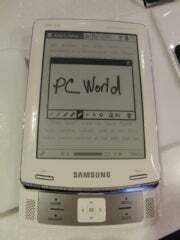 Tim Baxter, president of the consumer electronics division at Samsung, also noted that the unit can share content wirelessly with other identical units. "Reading can be as personal or as social as you want it to be," he said. Even though Barnes & Noble offers its own e-Reader, Nook, Barnes & Noble doesn't see a conflict, since the Samsung eReader would bring more users to the B&N e-book marketplace. "We want to enable e-reading everywhere," said Kevin Frain, executive vice president of e-commerce operations at Barnes & Noble. He noted that the Samsung eReader would be completely compatible with the Barnes & Noble ebook marketplace, including the LendMe feature, which allows you to loan content to other eReader users for up to two weeks. The Samsung eReader will be sold at a number of retailers, but not Barnes & Noble, however. In practice, when I tried the Samsung eReader's electronic resonance stylus, I found it allowed for accurate text highlighting. However, I experienced a delay between the time I raised the stylus from the screen and the time the highlighting appeared. Sliding the slim unit open revealed a center rocking navigation control flanked by two control buttons as well as twin speakers, which can be used with content that supports text-to-speech technology. The device also has a headphone jack, and can play MP3 files. The right side of the unit has a convenient volume control rocker, while the bottom has a miniUSB port for connecting with a computer. The unit can read PDF files, but it can't reflow PDF text. The eReader has a proprietary Outlook sync utility which allows you to import your calendar into the unit. 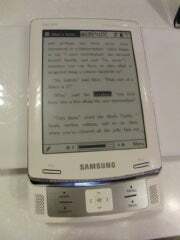 The eReader can also wirelessly share content with other Samsung e-Readers either on a one-to-one basis or to a group of recipients. Samsung says the eReader will be available soon at major retailers.